A guide to understanding the role of music in the liturgy. Available in English, Spanish and Vietnamese. 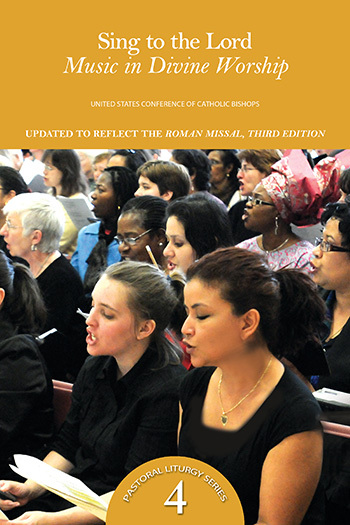 This book presents basic guidelines to better understand the role of music and its ministry in the liturgy. It addresses the practical concerns of pastoral leaders such as appropriate ministries, cultural diversity, instrumentation, training, acoustics and copyrights. Mục Vụ Thánh Nhạc echoes the call to full, active, and conscious participation in the liturgy through its sung elements. It also outlines considerations for preparing and judging music for worship with an in-depth review of the musical structure of liturgy. One of God's greatest gifts to us, his creation, was the gift of song. In words and music, our ancestors in faith -- Moses, David, Deborah, Paul, St. Gregory -- have taught us how to revel in God's infinite love, proclaim his glory, give thanks for his abounding generosity, and plead for mercy and forgiveness. Sing to the Lord: Music in Divine Worship recalls this vast, rich musical tradition as it provides basic guidelines for understanding the role and ministry of music in the liturgy. Standing on the foundational work of the Council fathers, Sing to the Lord echoes the call to full, active, and conscious participation in the liturgy through its sung elements. It addresses the practical concerns of pastoral leaders -- appropriate ministers, cultural diversity, instrumentation, formation, acoustics, and copyrights. It also outlines considerations for preparing and judging music for worship with an in-depth review of the musical structure of Liturgy. This book provides basic guidelines for understanding the role and ministry of music in the liturgy. One of God's greatest gifts to us, his creation, was the gift of song. In words and music, our ancestors in faith — Moses, David, Deborah, Paul, St. Gregory — have taught us how to revel in God's infinite love, proclaim his glory, give thanks for his abounding generosity, and plead for mercy and forgiveness. Sing to the Lord: Music in Divine Worship recalls this vast, rich musical tradition as it provides basic guidelines for understanding the role and ministry of music in the liturgy. Standing on the foundational work of the Council fathers, Sing to the Lord echoes the call to full, active, and conscious participation in the liturgy through its sung elements. It addresses the practical concerns of pastoral leaders — appropriate ministers, cultural diversity, instrumentation, formation, acoustics, and copyrights. It also outlines considerations for preparing and judging music for worship with an in-depth review of the musical structure of Liturgy. This book is the Spanish version of Sing to the Lord and provides basic guidelines for understanding the role and ministry of music in the liturgy. This book brings the vast and rich musical traditions of our ancestors in faith while presenting basic guidelines to better understand the role of music and its ministry in the liturgy. The book addresses the practical concerns of pastoral leaders: appropriate ministries, cultural diversity, instrumentation, training, acoustics and copyrights. This is the Vietnamese version of Sing to the Lord, providing basic guidelines for understanding the role and ministry of music in the liturgy.